I discovered your site some years ago when we had a cricket problem. The NIBAN-FG and outdoor stuff we sprinkled around did such a good job getting rid of them. Whenever we have pests I check your site for advice and products. Our problem now is mice, tiny mice. We have had problems with them getting into our kitchen in years past but never like we have them now. We have found signs of them in just about every room, including the bathrooms and on the kitchen table! We have put out snap traps, glue traps, live traps, and even tried the pecan paste or peanut butter. The mice are smarter than us! They don’t ever touch the paste or peanut butter and we have only caught a couple on the glue traps. We are about ready to try poison but your warnings have caused us to hold off so far. Any advice would be very welcome before we try that or have to hire an exterminator. Trapping rats or mice in the home can sometimes be tricky. Rest assured its not because they’re “smart”. I’m certain that we all are “smarter” compared to these small animals; the key is knowing how to best use our intelligence. 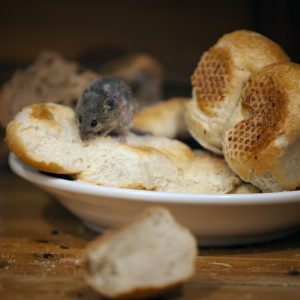 In most cases, people come to learn of a rodent problem (and when I say rodent, I mean mouse, rat, chipmunk, shrew, vole, flying squirrel or gray squirrel) because they either see it, hear it or find evidence like gnaw marks on stored food or droppings. That being said, I have to assume you have reason to believe there is rodent activity for one of these reasons. Now if you saw a rodent or heard some kind of noise in a wall or attic space, it would have to be an ongoing occurrence for it to mean you have a problem. In fact rodents will often times come into a home to seek temporary shelter and then leave. But if you are finding droppings or something chewed; its more likely you have some living inside. The key with all these “clues” is that the evidence is ongoing and consistent. This way you know you have an active issue that needs to be resolved. Next, the first step to get rodent control in the home is to figure out what they want to eat. Only then can you successfully use a kill or live trap. Now if they’re breaking into some kind of food item, then what they want to eat will be easy to figure out. 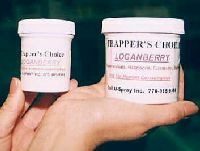 But if you’re only finding droppings here and there, you’ll want to remove the droppings and then set out some kind of food like our PECAN PASTE or LOGANBERRY PASTE. 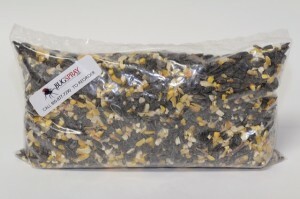 If you have pets, pet food could be what they want but if all else fails, go with MIXED BIRD SEED. Its highly nutritious and most small animals can’t resist a free meal. Remember that your placements should be out in the open, where you’ve spotted some evidence, so the active animal will find the food “naturally” as it forages about the home. The goal of these placements is to find out if you can get them to feed on something specific with no “interference” that can happen when the bait is used in a trap. Once in place, monitor the placements by inspecting them at least once a day. If you have a live animal on the prowl, they will at some point find your offering and feed. And once you find out what they want, trapping them using that same bait will be the next step. 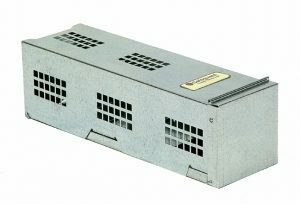 Now since many animals can be sensitive to the tension of a SNAP TRAP, using a live trap like our LT3310 will always be a great way to ensure you don’t encounter trap shyness. These traps will last many years and can catch any of the animals listed above. To use this trap efficiently, first set the trap out where they’ve been receiving your “free” food offer. Do this by setting the door open and placing some of the same food they’ve been taking at the entrance. Do not place any inside the trap just yet, just the entrance. And again, be sure to make this set where you were able to get the animal to feed. Expect your new offer to be consumed within a day and once it is, you can then put out another “free” offer midway inside the trap. This way your target will have to enter a few inches to get the reward. To be clear, this offer will not be behind the trip pan but instead, just in front of it. Oh, and place a little “refresher” at the entrance too but make sure more is in the middle. Now once this placement is taken, you can then make a “real” set that will catch him. Do this by making the placement at the back of the trap, behind the trip pan, with just a little bit of food in front of the trip pan. Since live trapped animals aren’t injured, trap shyness will not develop. I have used this trap to catch hundreds of animals over 15+ years and my trap still works fine. During time I’ve caught mice, rats, chipmunks, flying squirrels, gray squirrels and voles. I even had a opossum get stuck in the trap! I found it about 100 feet away from where I made the placement and the opossum had the trap wedged on its head. Being familiar with the animal, I was able to grab it by the tail and pull the trap off successfully without damaging the trap or the animal. My point is this method is sound and effective and will work like a charm no matter what the animal might be. Now once trapped, its up to you if you want relocate animals at least 10 miles away or destroy them. Live trapping any of the listed animals above will work every time but it does requires patience. And once you go at least 2 weeks without seeing new droppings or finding some other evidence, you can proceed with the proper closure and odor elimination needed to ensure more don’t come inside. In most every case, repeat problems is sign of “scent” trails being in place that lead to your home. These trails will continually attract new animals long after your remove the ones currently active. 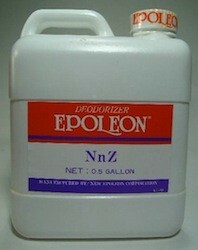 To neutralize these smells, spray NNz around the homes exterior, siding, etc. and this will effectively prevent new ones from coming around looking to use your home for their home.